With the changing season we change our clothing needs, while we are now in the monsoon season, we have to welcome our monsoon collection in our wardrobes, a little short and a little warm is what needed. So, this is the right time to re-organise the entire wardrobe with the new arrangement for the new clothes. A cluttered wardrobe is not the first thing you wish to see after coming home from work, so let’s get your clutter in place and organise all the seasonal clothes in the best possible way. The wardrobe looks perfect if you have different cabinets for different purposes. Like a cabinet dedicated for clothes, other for shoes and other for hats or anything else. You can even go for separators in the drawers for sectioning your accessories. For instance, a rack for sunglasses, a rack for other small items. As different fabric needs different care it is vital for us to keep everything accordingly. Make groupings of your dress and hang them categorically. Like the denims can be folded up and kept on the shelves, while the pashmina's and other silk clothing has to be crease-free so hang them on the hanger. Wardrobes can be managed according to your needs, so make sure you do it in the right way. You can even group them according to a particular dress up, like if there is a denim skirt that goes perfectly with a white tank-top then place them together. This will help you find the entire dressing at one place. Add separators made of cardboard in the drawers of the wooden wardrobe. This will separate an entire drawer into sections. This will facilitate you to keep genre of stuff separately. For instance, you can assemble all your sunglasses in one rack and in other section all the handkerchief; this will keep sunglasses scratch-free and handkerchief clean!! So, all the itsy-bitsy things such as ties, belts, wallets, hats, scarves, etc., can take a peaceful rest in drawers and the sections created by cardboard. This will avoid the jumbling or mixing up of the stuff and help you to find the item in seconds when you are in a rush. So, if you have less space in your closet then go for these simple hacks mentioned above. Also, make sure you create a column of not frequently used clothes and most used clothes. You can even organise the wardrobe into work clothes and casual and party clothes. This will help you to utilise the less space efficiently. Leave the last shelf of the wooden wardrobe for your footwear. It's the perfect way to keep that expensive foot-clothing dirt-free and safe. Arrange them in a fashion, like the wedges together and then the stilettos together and create a section for the casual flats and shoes. No matter how carefully you arrange the wardrobes they might turn the same clumsy ones the next morning, so make sure you follow up a weekly clean up. If you have bought something new, then place them in the categorised section according to what genre they belong. As, sometimes we miss out on an outfit that is pretty but has not be worn by you for months, so for this keep a check on the wardrobe every once in a while. Throw away the clothes that are torn and make space for the new ones. Above you have encountered some of the ways, you can keep the beautiful armoire all set and organised. Follow it on a regular basis and keep your bedroom clutter-free. An organised wardrobe is how people will have an impression of you, make sure you build a nice one!! 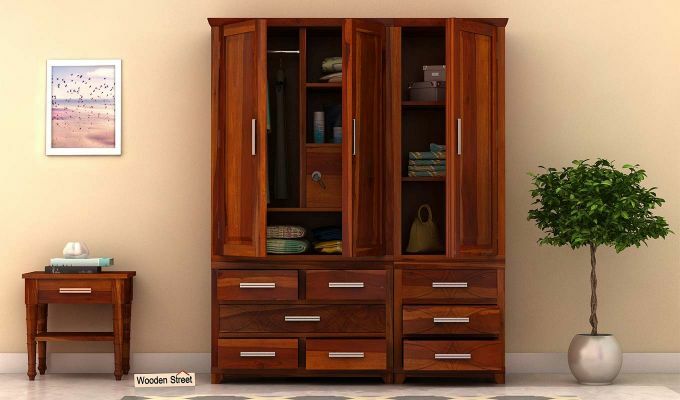 And, if you are looking forward to buy a new wooden wardrobe online then hover over the fantastic facility of customisation where you can decide the number of racks and shelves according to your requirements. A bespoke wardrobe will help you to use every inch of the space! !